So the man not only has taste but good judgement as well. Has he discovered that he can get the entire works of Dickens free on kindle? lol! 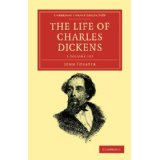 I love Dickens and reading them all together is a great idea. Maybe I will tackle that next year...in audiobook for for me though. A man after my own heart - I'm also on a read-all-of-Dickens marathon (starting my Books To Read Before I Die list)- just mid Dombey & Son also on kindle, what a difference it makes with books that long, especially on planes!